This year Santa Rosa County’s Career Academies produced over 800 industry certified graduates in areas ranging from graphic design to construction to biotechnical fields. Certifying organizations include Adobe, the National Center for Construction Education & Research, Microsoft. Santa Rosa County’s Career Academies prepare students for college and career by providing them with the skills needed to compete in the global economy. Here they can obtain specialized training for in-demand fields such as healthcare, manufacturing, agriculture or energy. These rigorous curricular opportunities ensure students are ready for high-skill, high-wage careers, engage them with hands-on learning and reduce high school dropout rates. Santa Rosa Career Pathways is a collaborative effort led by Santa Rosa Economic Development and the Santa Rosa County School District. It's a program to showcase local career opportunities, including the expected wages and the career academies, training, and degree programs available to prepare for the career. 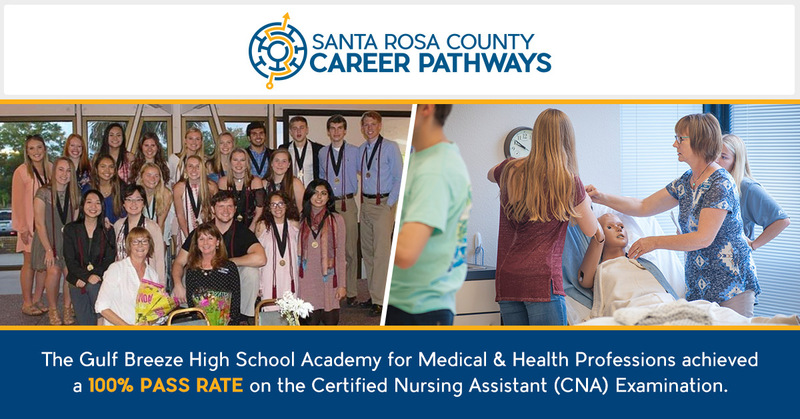 Find out more at SantaRosaCareerPathways.com. Educating the Next Generation for Florida’s Growing Cybersecurity Industry.